Chapter 2 Page 4 is up. Jassart is on the prowl while Blaise has his suspicions confirmed. 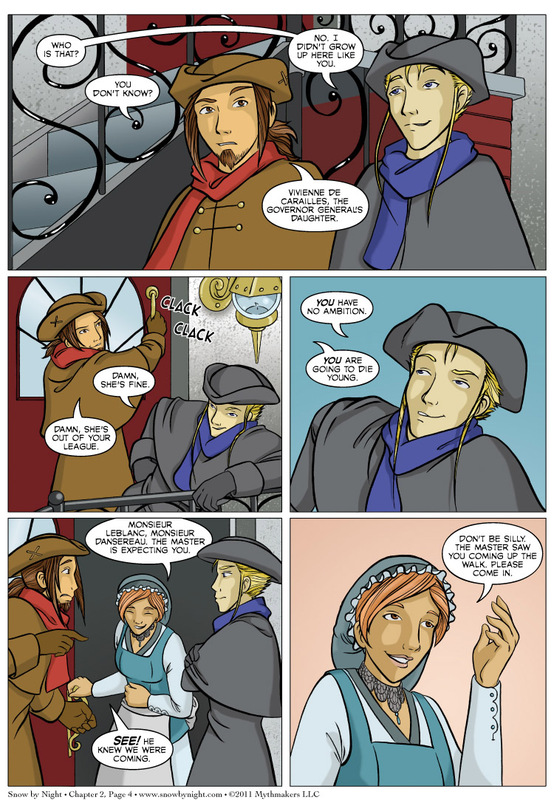 For a sneak peak at a fabulous alchemical flintlock rifle, take a look at this week’s vote incentive on Top Web Comics. That third panel is Blaise and Jassart in a nutshell. Though Blaise may be overestimating his own life expectancy…. Hehe. I love this page! The second and third panels are priceless! The advance look at Monday’s alchemical rifle reminds me of the real-world Girandoni air rifle (http://en.wikipedia.org/wiki/Girandoni_Air_Rifle), which was used on the Lewis and Clark expedition (hence very similar worlds). The Girandoni could fire its full 20 rounds of .46cal ball shot in thirty seconds, and (according to a fellow who’s fired what he says is a precise replica) could punch through 1″ pine boards at 100 yards. An alchemical equivalent makes my geeky heart dance! A cookie for you for catching that reference. I thought it was pretty obscure. Our chimeric rifle mostly draws from the element of Earth, rather than Air as the Girandoni would. I’m a blast at cocktail parties, I’ve gotta admit; a veritable font of useless information I am. Also, if you’re a fan of Lewis and Clark in general rather than obscure firearms specifically, you might be interested to see http://www.powells.com/biblio/17-2221135459321-0 – one of twenty-some copies of the first printing of the L&C Expeditionary Journal remaining. It’s worth more than my house, and very pretty. The look on Jassart’s face in the third panel is priceless! This is an awesome comic. Yeah, I heart it. It took all of a week to vault into my top two or three.